When inspiration strikes the Level Zero team we are usually sitting, watching some TV or playing games and one of us pipes up “Hey, wouldn’t it be cool if…?” and so begins a lovely talk about a new idea. Some ideas only go that far and rightly so, talking about AAA titles we can’t make till we can throw millions on the table is all good and well though! We write them down for later. The MEAT of the conversation comes with an idea we can actually make. Look in your phone, on your contacts list, on facebook and next to you. Is there a team there, ready to work and devote lots of time and effort to your project? Chances are the answer is no! Not all of us work in offices, or have enough free time and expendable income on our hands to work on a project that may or may not pay us back. A project for a student group needs to factor in midterms and finals, a project for graduates needs to factor in dayjobs and equipment needed. You can’t design without the right tools! The real key to having a small productive team is finding dedicated people with solid work ethic who want to get things done. With the right kind of motivation a small team can do amazing things! So once you’ve got the people and the can-do attitude fired up, you’re ready to take the big first step. All good projects have a heavy layer of top-level organization that makes them easy to read, edit and work from. We use a number of productivity tools for this. I’ve listed a few you should take a look at! Dropbox is a free file-sharing service that installs itself to your Documents folder and behaves as a literal dropbox for files. You can put anything in there (up to 2 gigs free, more when people sign up using your referral), and it instantly syncs with not only the online storage space, but anyone you’ve shared the folder with. This allows a team to all share one folder, so no duplicate documents get saved or made, and the updates are all automatic. It feels natural and it works well! Dropbox has one problem: If you open a document that’s already being worked on, it saves out an “alternate” copy when you are done. Luckily, all you have to do is check with whoever edited the last document (the recent changes are all saved online in a “history” feed), and keep the correct edits. No worries! Be sure to organize your folders well! There’s a reason folders can be put inside folders! 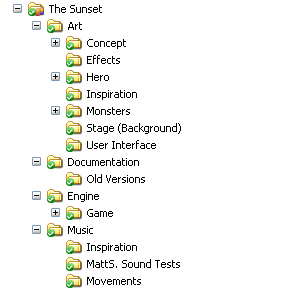 Having one folder with all the games documents in it is messy and will lead to bloody ends. Here’s an example of how I would organize a file structure for a new project. Inside of those folders you can get creative. An “Inspirations” folder for sound and art? A “Sketches and Scrap” folder? Flesh out the lower levels but keeps a tight reign on where things get put! Art in art, Sound in Sound…etc. The folder structure will help your and your team find things they need quickly and easily, and with Dropbox you’ll all know immediately when someone edits any of the documents! SVN is a combination of Subversion (the thing on the website that hosts the files) and TortoiseSVN (the thing we use to interact with Subversion from our computers). It’s a lot like Dropbox but there’s an important difference: SVN keeps tracks of who has documents out for edits, it has a log of changes, and (our version) doesn’t sync files automatically across everyones computers. It’s a shared online space where you can upload files, and save them to your hard drive, while making sure you’re not “breaking the build”. We use SVN only for game builds, and code. When working on a project all non-code files go in Dropbox, and all engine/game code goes on the SVN, including the final game assets (images, sprites…etc…only what’s going in the final compile). Evernote is a note-sharing service that allows you to save anything (clips, exerpts and even voice recordings) and save them to an online shared folder. Then you can access them from anywhere. Evernote is great is great for when inspiration strikes at odd times, or when you want to snap a photo to remember something. It even reads text from your pictures, interprets handwriting and lets you search your notes for tags it generates. Evernote may not be something we use daily, but we use it a lot. You never know when the good stuff bubbles up. Google Wave invites are a dime a dozen these days, with more people signing up daily. But what is it? Google Wave, some would argue, is what Email is going to become. Google Wave lets you invite collaborators to “waves”: strings of posts under a subject heading that can all be edited in real time. While it seems like a waste of time, given Emails get the job done, the focus is on working on something with another author. Using Wave requires REMEMBERING Google Wave even exists (it is still in beta, and the only notifier for it so far is a Google Chrome Beta Extension), and a focus on working together. We’ve used Wave in limited amounts, but it worked great when coming up with the name for Net Gain. John and I sat in there and made a BIG brainstorm list, leaving real time comments on names we liked, bolding the finalists and eventually I thew Net Gain on the table and it stuck. Now we have the Wave to remind us of the names the game almost was, and our inspirations behind it! Not a bad deal! Not even joking. Word is great at organizing documents infrastructure and keeping track of versions and revisions. Learn to use this tool well. Open Office is great and all but if you want to make games, you gotta use the big boy tools. Word has been invaluable. Once all of that is out of the way, you can start planning the pre-production. That’s right. PLANNING the PRE. Awesome. But having the structure, and keeping a tight grip on it will only help. It may drive you crazy if you’re not used to using multiple programs/interfaces for sharing information but trust me, it’s been a habit I am thankful for developing. Organization is tough with projects that involve multiple people, and just as tough when its only you. Communication aside, having the information ready to kick into gear could be the most important part of the process. So give a few of the above methods a try, have some fun. I use at least one of them every day, if not more. Take care, have a great day and thanks for reading!